Shirts With Random Triangles: Mississippi St. QB Tyler Russell still not "cleared for contact" after concussion in season opener. 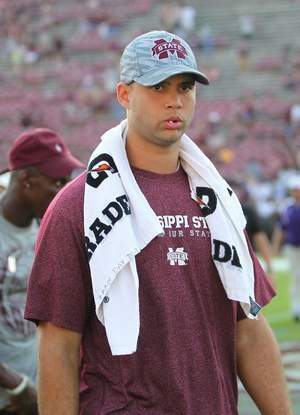 Mississippi St. QB Tyler Russell still not "cleared for contact" after concussion in season opener. Mississippi State quarterback Tyler Russell received a concussion during the Bulldogs' season opening loss to Oklahoma State. After missing the Miss St. win over Alcorn State, he dressed out for last Saturday's game against Auburn, but didn't play. Miss. St. head football coach Dan Mullen explained that Russell hasn't been "cleared for contact" yet. According to Mullen, “We have him with a top spinal doctor, one of the top in the country in there, evaluate him before the game. He said, ‘Hey, I just don’t feel comfortable with him going into a game with contact."